Here Comes The Planet is being repurposed like an old milk bottle. But instead of cutting it into a funnel or a mini greenhouse for my tomatoes, I’m going to use it to promote my People Projects. There’s going to be a new project every so often (I’ve been doing lots of thinking on my drives to and from work) and the first one is my campaign to help my brother and his fiancee get married! For FREE! They are finalists in a radio competition and to win they need to get the most votes. 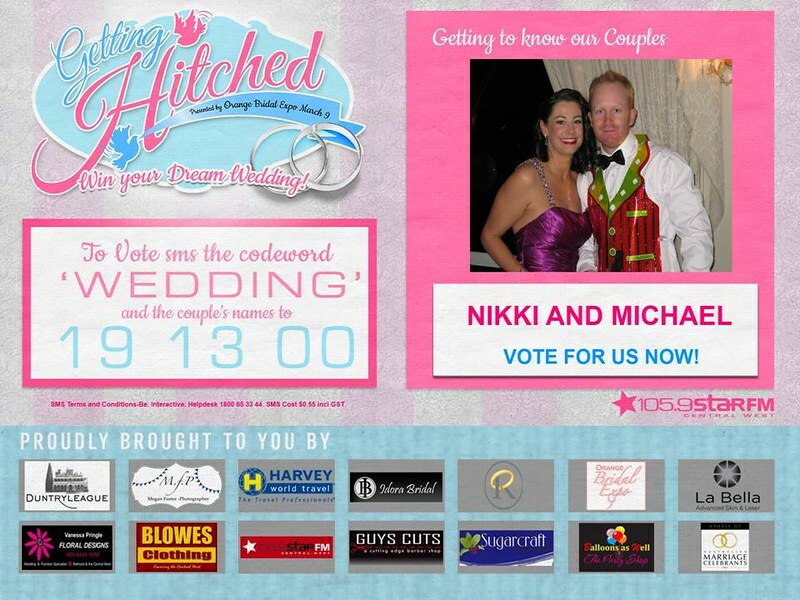 People vote by sending an sms (only one per number) to 191300 reading ‘Wedding Michael Nikki’. My goal is 1000 votes (apparently 713 won last year) and I’m going to do it by harrassing everyone I know – and lots of people I don’t know. Tonight is White Night, a festival in Melbourne where all kinds of things happen all over the city all through the night. I’m figuring the crowd will be in the mood for interacting with strangers and that stranger should be me. I’ve made a cardboard sign and I’m ready to roll. If you can help by sending a text please do so (and get every phone in your house busy!) and leave a note here so I can keep count! My brother, years ago, helped me out when I was low on cash and got me started with enough money to buy my first sewing machine and so this is how I can help him out and do something he’ll hugely appreciate. He and his fiancee Nikki are raising a family, building a house and running their own business. They are wonderful people who deserve to win! Photos to come tomorrow of me humiliating myself in the city! have voted! Good luck and have fun! Hi Amanda. I tried to send an SMS but got a message back saying that Premium SMS are not available on my service provider – sorry! Is there a way I can vote online?